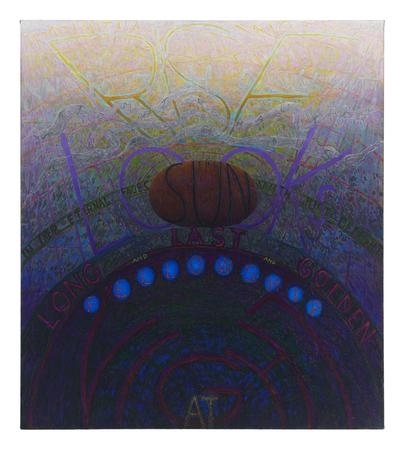 Over the past 20 years, Philip Hanson has explored the intersection of text and image in paintings that complexly layer dense, richly colored patterns with excerpts from poems by Emily Dickinson, William Blake, William Shakespeare, and other Romantic era poets. 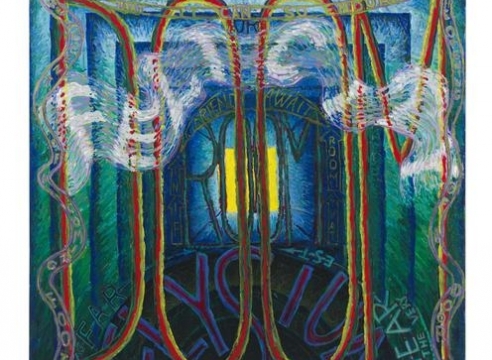 Long associated with the Chicago Imagists, Philip Hanson was featured in the seminal False Image exhibit at the Hyde Park Art Center, Chicago in 1968, along with Christina Ramberg (1946–1995) and Roger Brown (1941–1997). Words in Hanson’s paintings glint across unfurling banners and pass through layers of interlocking spaces characterized by dramatic shifts from light to dark. Utilizing the structure of the letters themselves and a bold palette of color, Hanson reinvents the language through its shape and therefore impacts its meaning as well. Hanson studied poetry at the University of Chicago when the New Criticism movement was the dominant influence in criticism. The movement was characterized by a close, line by line analysis of a poem and should be seen as a touchstone to Hanson’s continued interest in poetry and his willingness to diagrammatically break down and redeploy a poem across a network of illuminated supports that add to, rather than appropriate from, the poetry that inspires them. Hanson’s work is also fueled by what curator Michael Rooks refers to as the “New Sincerity ethos of the past several decades: a paradigm in which the pursuit of grand universal truths, like the virtues of love, are conditions by an innate skepticism, with an ethos that searches for a truth that it never expects to find.” The excerpts that Hanson selects from poems such as Dickinson’s “I am nobody! Who are you?” and Blake’s “The Sick Rose” possess this sincerity and resignation that has resonated over generations, and which Hanson is able to externalize in his paintings. Hanson has actively exhibited his work both nationally and internationally since the late 1960s. His work has been featured in numerous group exhibitions, including the 2014 Whitney Biennial, curated by Michelle Grabner; Chicago Imagists, Karma International, Zurich, (2013); and Art in Chicago, 1945-1995, Museum of Contemporary Art, Chicago (1996). 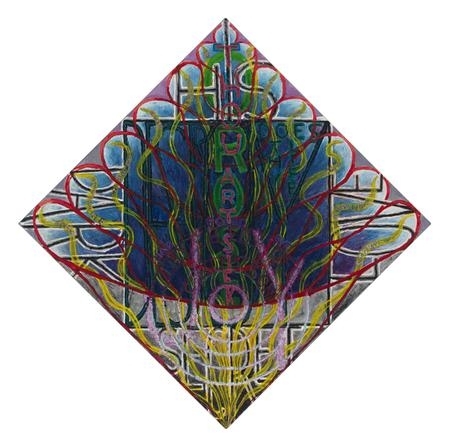 Prior to this, Hanson showed with the Chicago Imagists in exhibitions such as the seminal False Image at the Hyde Park Art Center (1968), as well as the Museum of Contemporary Art, Chicago (1969 and 1972); the Institute of Contemporary Art, Philadelphia (1969); and the Sao Paulo Biennale (1973). His work is in the permanent collections of the Museum of Contemporary Art, Chicago, the Art Institute of Chicago, the National Museum of American Art, Washington, DC, and the Museum des 20 Jahrhunderts, Vienna. Hanson (b. 1943) received his BA from the University of Chicago and an MFA from The School of the Art Institute of Chicago. He currently lives and works in Chicago, Illinois.